A Thunderous Review! Thor Ragnarok Review - Is it Good? Home » Films » A Thunderous Review! Thor Ragnarok Review – Is it Good? Thor Ragnarok has released just recently and it is making a blast among Marvel fans. People were afraid of that the movie would not be as good as their expectations, especially when it based on a serious event like Ragnarok. Furthermore, the film’s director Taika Waititi comfirmed that Thor Ragnarok would be an action-adventure/comedy movie. All lead us to a question: is Thor Ragnarok good? Does it meet our expectation? Let’s find out in this Thor Ragnarok review! 2. How good is Thor Ragnarok? There is a good reason why Marvel fans got worried about Thor Ragnarok, and that is its base storyline. Since Marvel took the real-life Norse Mythology as inspiration for their own Marvel Norse Pantheon version, no doubt they also borrowed the famous Ragnarok event. We all are probably familiar with this cataclysmic event. Basically, Ragnarok (also known as Twilight of the Gods) is an Armageddon which marks the end of Asgard (the realm where Aesir gods like All-Father Odin, Thunder God Thor, and God of Mischief Loki reside). The event started when the All-Seeing God Heimdall spotted the tremendous giants army marching towards Asgard, and among them there was Loki. Heimdall alerted other gods by sounding the horn Gjallarhorn, warning of an unavoidable battle. Of course, the Aesir gods couldn’t simply wait and die. Even if they would die, they would die valiantly. 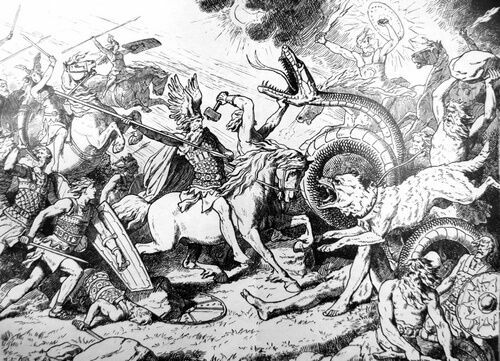 And so the battle begun, the gods fought their enemies and fell together: Thor battled with the massive serpent Jormungand; Freyr fought against the Giant with the Flaming Sword – Surt; Heimdall had a death battle with Loki; while Fenrir (son of Loki) slew Odin and Tyr, yet it fell later on under the hand of Odin’s son – Vidar. As the results, everything fell into darkness until the day new life, new cycle started to flourish anew. So, that’s the real-life Norse Mythology version. What about the Marvel Comics’s Ragnarok version? Basically, the main concept of Marvel Ragnarok wasn’t as much different from the real-life Norse Mythology version. But since it already happened in Thor series, it would be more interesting for viewers if we don’t spoil the story. Instead, we will only cover the Ragnarok event according to Volla’s Prophecy. Based on this prophecy, Ragnarok would begin when the enigmatic Fimbul Winter came to Asgard. This winter wasn’t our normal winter in real life. Fimbul Winter in Asgard would shroud the entire realm, leading its inhabitant into fear and paranoid. Thus, fellow gods and friends went insane and fought each other. This marked the beginning of the so-called Ragnarok. When Heimdall sounded his horn, Ragnarok would begin and the gods of Aesir had to fight against the invading army of Trolls and Giants, led by no other than Loki himself. Here, Thor and Loki faced each other in their final fight. Eventually, the Midgard Serpent would rise and assault Thor. Despite Thor’s victory over the serpent, Asgard was already torn apart. 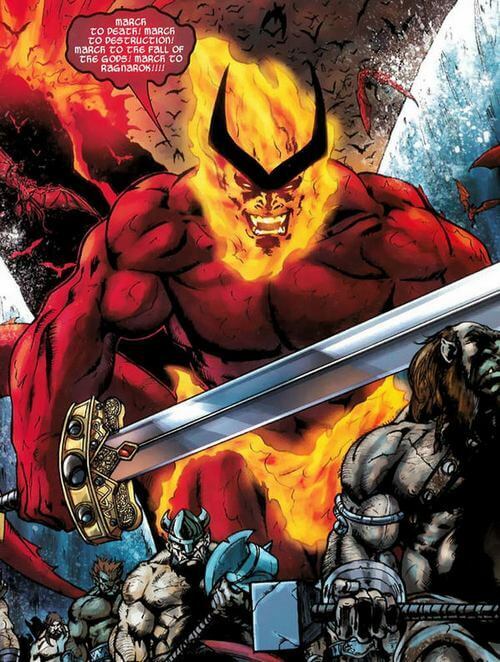 Finally, the Surtur the Fire Lord would burn all everything left to ashes. Of course, this event doesn’t mean the ultimate end of the gods, as one day new gods will arise and usher the new age. Now that we have seen the story of both original Ragnarok and the Marvel Ragnarok, let’s see how fare that story in Thor Ragnarok goes. Again, the Ragnarok event in Thor Ragnarok has the similar concept as Marvel Comics version. But the thing is: how well they can deliver such a serious event into the movie? In general, let say they did quite a great job in delivering such an amusing film to watch. But for people who are expecting a serious movie, unfortunately we have to say that you will be much disappointed. By all means, Thor Ragnarok isn’t an all-out serious film; instead, it is a comedy movie with action-adventure aspect. Thor Ragnarok picks up what left from the Avengers Age of Ultron when Thor decided to set out and find out about the disturbing vision he has been receiving. Soon, he finds out that vision is about Ragnarok which warns him about the end of Asgard. At this point, Thor and Loki discovered the identity of their sister Hela who has just escaped from her prison not long ago. Now, Hela the Goddess of Death has returned and she wants to claim the throne of Asgard for herself. Naturally, Thor and Loki can’t simply accept this. Thor tried to stop her, but failed miserably, similar to what we’ve seen from the trailer. Not long after, Thor fell to the world of Sakaar, a prison world monitored by the Grandmaster. In order to escape from Sakaar, he had to defeat the current champion. Here he met Loki (again) and surprisingly, the Hulk (again… in a not-so-heartwarming reunion). Eventually Thor managed to return to Asgard, but this time with his new team including his mischievous brother Loki, his “friend-from-work” Hulk, and the hard-drinker Valkyrie. Again, Thor Ragnarok isn’t a serious film. So if you have already expected this, Thor Ragnarok will provide a great fun time for you. Throughout the film, we will see lots of jokes and other funny moments. Fortunately, all of these funny jokes and moments are well placed and we won’t feel like being shoved bunch of lame jokes. One thing makes Thor Ragnarok interesting is that: it seems the movie allowed characters (or actors) to express themselves more openly. We know that in previous 2 Thor movies, Thor is not exactly a serious type. 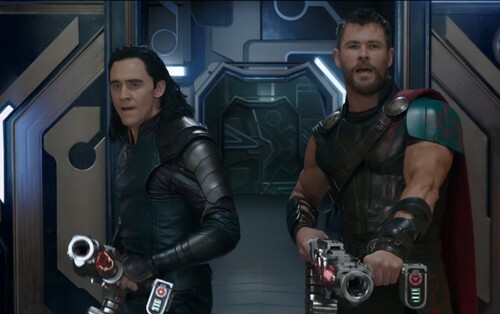 And in Thor Ragnarok, he seems to be even less serious as Chris Hemsworth had opportunities to express his funny side, including explaining how Mjolnir works and the “get help” funny moment between Thor and his brother Loki. That said, this doesn’t mean the funny Chris Hemsworth‘s Thor doesn’t fit in the overall story. Let’s remind us all that ever since the first Thor movie, we don’t exactly see the importance of the Asgard, so too Thor in the Thor Ragnarok. He didn’t know how important his homeland to him. All this time he has fought for his own purpose; and it just happened to relate to Asgard to some extent. 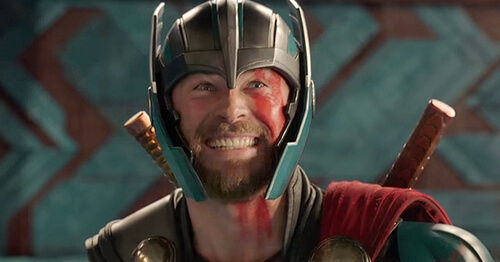 This allowed Chris Hemsworth to portray Thor as a funny god – a god who thrived to become a good guy, or rather, a big silly good guy. Thor Ragnarok brought back few familiar faces, along with many new characters like Hela the God of Death, the Grandmaster, and Valkyrie. First off let’s talk about the villains (since how good is a hero movie without a good villain?). The main villain in Thor Ragnarok is none other than Hela the God of Death who has just escaped from her imprisonment. 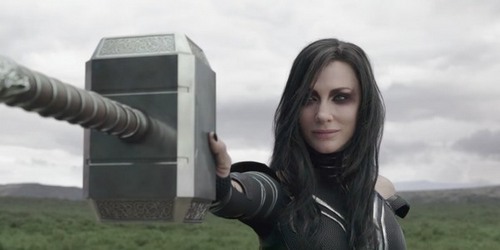 Unlike Hela in Marvel Comics (who is daughter of Loki), Hela in the movie is a sister of Thor and Loki. Like Thor and Loki, she is contender for the throne of Asgard, yet she doesn’t plan to play nice. Her malevolence and pride are excellently portrayed by our star Cate Blanchett. 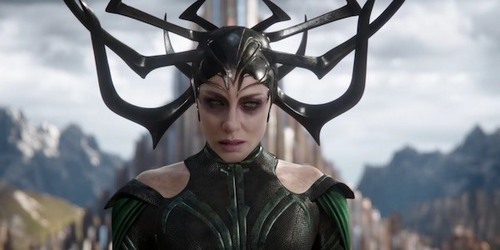 Hela felt real, powerful, and also evil at the same time. The God of Death doesn’t stop at nothing and she readies to kill everyone in her path, including her brothers. Hela’s appearance also suits her perfectly, especially with the spiky, enigmatic looking helmet. Next we have the Grandmaster – one of the Elders of the Universe and in Marvel Comics, this guy is really obsessed with games. 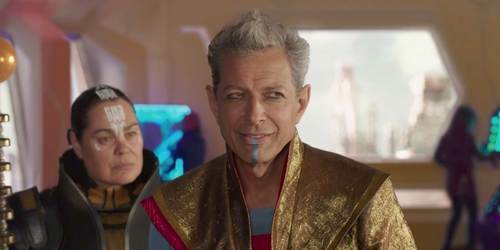 In Thor Ragnarok, the Grandmaster monitors the world of Sakaar where prisoners have to fight to death if they want to live. Frankly speaking, the Grandmaster isn’t exactly a villain here since he is just doing his job: enjoying battle arena and he doesn’t do any particular harm. That said; the Grandmaster is a fine addition to this comedy movie with his maniac style, precisely portrayed by Jeff Goldblum. Finally we have the Fire Demon Surtur himself, played by Clancy Brown. Let’s not talk about him much but let’s just say that he is extremely badass. Now that we have awesome villains, what we need is a chosen hero… or rather, a bunch of heroes. Coming first is our beloved God of Humor… sorry, God of Thunder Thor with his trusty lightning hammer Mjolnir. Unfortunately, he lost his hammer again, but for a good reason. As mentioned above, our God of Thunder Thor is still as funny as ever, especially when Chris Hemsworth can go “wild” with his jokes this time. So if you want to see a serious Thor, you won’t see any in this movie. But you will surely love this funny, yet silly Thor if you are fine with enjoying comedy. Coming in second place we have Loki by screen-stealer Tom Hiddleston. Though Loki is not the main center of this new movie, Tom Hiddleston’s Loki still looks charming like always. 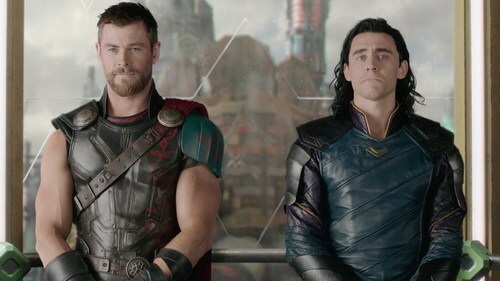 Especially we have an emotional moment between the two brothers Thor and Loki… until it is wrecked by Thor’s “get help” plan. 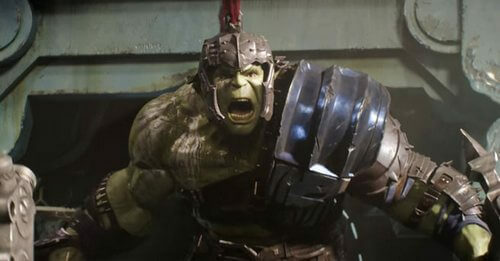 Thirdly, we have Mark Ruffalo returned as our favorite The Hulk, a.k.a Bruce Banner. Interestingly, The Hulk is much more interesting than we expect. When The Hulk meets Thor again (in a proper manner), it truly feels like 2 old friends meet each other again and share their stories with each other. The Hulk this time is able to speak and he actually speaks a lot about himself, although he can only speak simple sentences. 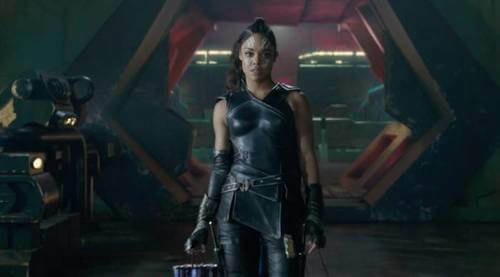 Then finally we have Tessa Thompson in the role of Valkyrie and she totally nailed it with this character. Valkyrie is like Han Solo of Thor Ragnarok. At first she is like a selfish figure. But gradually, she gets to know to more about Thor and eventually she decides to side with him to save Asgard. At side note, surprisingly we have the director Waititi himself who totally catched us off-guard with his mellow voice for Korg. He may not have splendid voice for Korg but in such a comedy film like Thor Ragnarok, he definitely adds more fun level to the movie. Putting comedy aspect aside, Thor Ragnarok’s biggest weakness probably lies within the story itself. Basically Thor Ragnarok follows our tradition pattern: bad guy fighting good guy, the bad guy wins firsthand but then the good guy will return and triumph the final victory. And once again, this will be a nuisance for viewers who look for serious and enjoyable story with twists and turns. But what if we accept the fact that comedy is the main thing in Thor Ragnarok? We have to admit, the jokes are good, the comedy is good. It is not exaggerating to say Thor Ragnarok is the funniest Marvel movies to date. However, the previous 2 Thor films aren’t exactly comedy. They focus on the action-adventure part and comedy is just a welcoming addition. Therefore, going full comedy-mode in Thor Ragnarok is kind of… weird. Another thing is that the movie may feel “disconnected” to some extent. Thor Ragnarok can be broke down into 2 parts: the Asgard and the Sakaar. Yet somehow, these 2 parts don’t exactly connect well. It felt kind of weird when the first section of Thor Ragnarok gives out serious vibe with a great villain. While later on it changes to comedy where Thor is like a God of Humor and everything happened in Asgard was forgotten. Overall, Thor Ragnarok is an excellent comedy movie. You will be able to find lots of funny moments throughout Thor Ragnarok, especially with your family and friends. No wonder why many people start to refer Thor Ragnarok as the funniest Marvel movie at the moment. That said; you won’t be a fan of this film if you focus more on the story and serious vibe. Despite basing on a cataclysmic event, watching “Ragnarok” doesn’t make you feel like witnessing a disastrous event at all. Most of the time we will tend to forget the serious threat and instead, having fun time with funny jokes and moments. For us, the final verdict for Thor Ragnarok would be 7/10. It does excel at comedy but it would be best not to take the movie too seriously. If not, you will feel extremely annoyed by the comedy aspect in Thor Ragnarok. But what do you think? Do you find Thor Ragnarok a good movie? Feel free to share with us and for now, thank you and stay tune for more news in the future!